When Yair Cohen created the first UK exclusive Internet Law department in a a law firm, few people truly understood the nature of his work. It has been nearly 20 years since Yair delivered to a client the first internet law legal advice. At that time, there was no other lawyer in the UK who described himself as an internet lawyer as many in his profession doubted there will ever be a need for such a niche within a law firm. 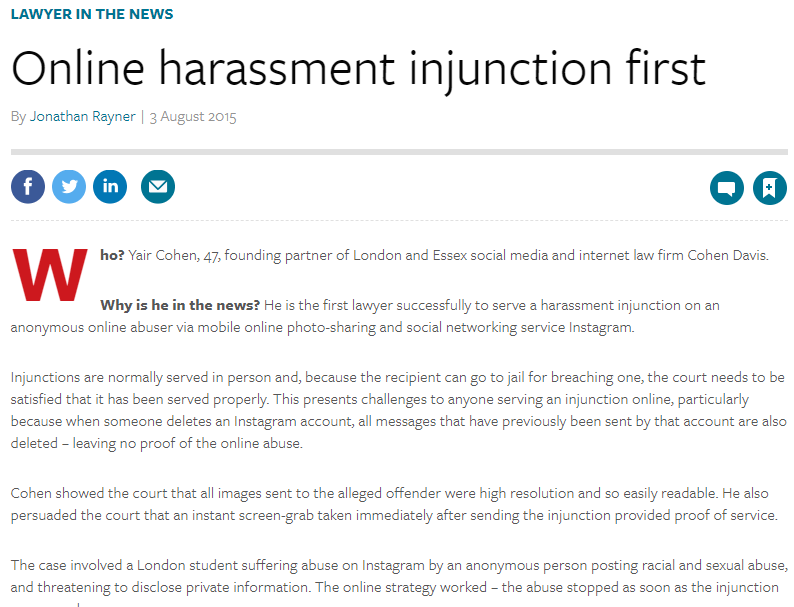 Since then, internet law has evolved and as social media was developed in the US, Yair was already hanging around with US attorneys, advising on the implications of social media, as it was starting to catch on in the UK. With social media came the need to protect companies and individuals who often had been victimised with defamation, online harassment, breach of data and misuse of private information. Behind Yair Cohen, there are thousands of hours of patiently giving advice on social media and internet law. It is therefore very likely that if you suffer from an issue arising out of the use (or misuse) of social media, it would be an issue that has already been considered by Yair and once which one of his hundreds of loyal clients has already been given advice on. It is also highly likely that the internet law or social media matter that you suffer from, has already been resoled for someone else. Being an authority on social media law, Yair is happy to to share his knowledge and experience with you too.